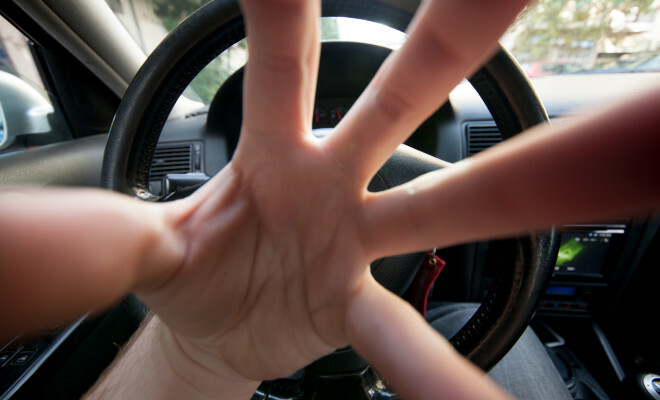 Most of the reviews on the web today are all following the same philosophy… pumping us with some mathematical data that have nothing to do with reality, and with that, forming your opinion before you even see or try the product. Before I tried this lens, I have read many reviews on the web, and none of them barely made any sense. 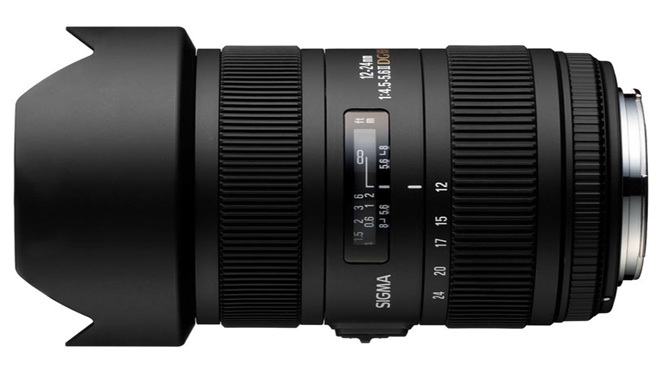 After I’ve spent some time with the Sigma 12-24mm F4.5-5.6 DG HSM II, I simply must write a short review. All the reviews of this little magic Sigma are ignoring the main reason why this lens exists – interior photography and architecture. And when that comes to question, this is not your ordinary wide-angle lens. This is the new version of this lens. I will not compare it to the old one because I have never used it or seen it. Sigma 12-24mm F4.5-5.6 DG HSM II, has a very decent construction, and it’s packed in the Sigma housing of the newer generation (but not the 2013. housing). It’s entirely bright black, with no golden ring on the front. It’s mostly poly-carbonate body with a metal front part and a metal non-removable hood. Also, the cover that you put over the lens hood in order to put a lens cap on it is also made of metal and feels very solid. If you keep the metal cover on while shooting, on 12mm it will give you a perfect circle-effect in the middle of a frame, funny to try. And of course, like on all top-notch Sigmas, the lens mount is made of stainless steel. Despite being a 12mm lens, it’s almost as long as my Canon 24-70mm f2.8L USM, and it’s 670 grams heavy. The reason for being this big and heavy is the main secret of this lens – it has distortion correction glasses. When geometry comes to question, what is crucial for interior and architecture photography, this lens sends both Canon 17-40mm f4 and twice more expensive 16-35mm f2.8 into the corner of shame. They are absolutely no match for this sigma for interior and architecture photography. This is the closest thing to a Canon TS-E 17mm f/4L if you cannot afford one. The photo above was shot with no “cheating”, meaning that I had an eye looking trough the viewfinder all the time, and all the thickness of my 5D + the length of the lens in front. I was not more than 40-50cm away from the center console. After we concluded how wide is it, what most of you fear is how bright it is. f4.5 to 5.6 does not seam much, but my short answer is: it’s more bright than it’s necessary. I will tell you again, I’m mostly doing interior and exterior photography for hotels, villas, apartments… and that is what I do for living. Those who do the same will completely understand what am I talking about. All interior photographers are working only from tripods, also, they are always pushing the lens to the limit of maximum sharpness. I never do interior with aperture larger than f8 if I am under 20mm. If I’m over 20mm I never go larger than f11… it’s simply my rules. I want everything nice and sharp, I want light sources to be pretty stars, and with a camera attached to a tripod I have all the time in the world, meaning that ISO other than ISO100 does not exist for me. This is exactly what this Sigma is made for – delivering sharp photos at apertures from f5.6 to f11, and instead of giving you a barrel distorted image (like 17-40 or 16-35) it’s giving you an optically (not by software, but by glass elements) corrected image. 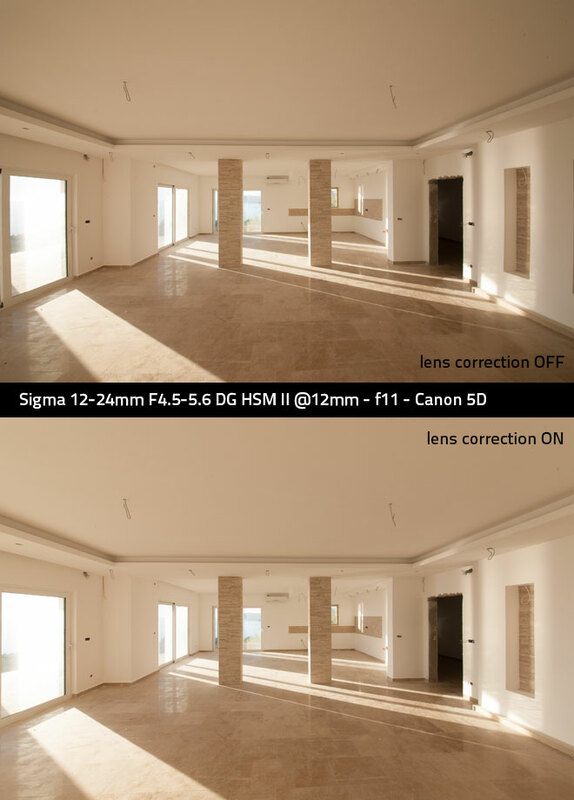 When I was shooting interiors with 16-35mm or 17-40mm, or any other wide angle lens for that matter, I always applied lens profile correction in Lightroom. Of course the profile correction helps with vignetting and with the distortion for a certain amount, but still nothing that can correct crucial flaws of these lenses. Like with all wide-angle lenses, things that are on the edges of the frame appear closer, and things that are in the center of the frame appear more far than they actually are. 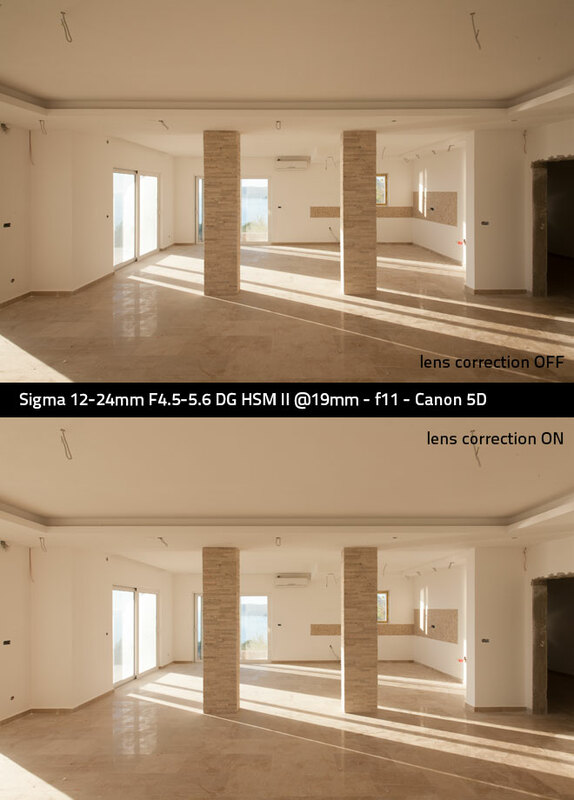 However, that is not the case with Sigma 12-24mm F4.5-5.6 DG HSM II. Here are some examples so you can see for yourselves. @17mm and over – practically ZERO distortion. Interiors look as straight and sharp like they were rendered directly from 3D studio max. While shooting interiors, you start seeing the physical imperfection of the buildings, and occasionally you discover a wall that is not completely straight (yes the lens is that good). @24mm – it’s so straight that you can even make a portrait, and frame it by the rule of the thirds, and a human subject will still look completely normal, like they were shot with 50mm lens. All that you need to care, is that you keep your lens 90 degrees straight towards your subject, if you start tilting the camera up and down, geometry will be deformed on the edges again, what is inevitable, and also irrational to do so. You practically always shoot interiors and architecture in straight lines. 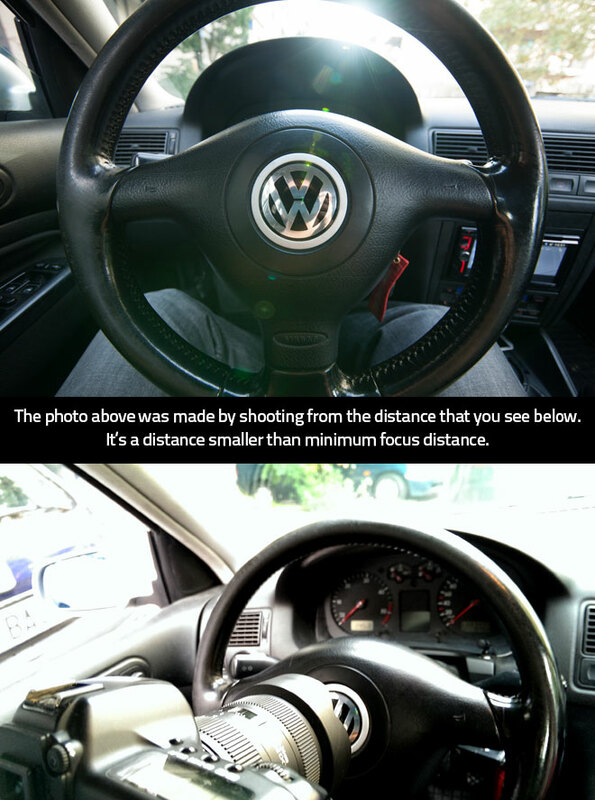 The fact about the sharpness with this lens is that it does not vary (much) when aperture changes. The largest difference can be seen on the edges. I almost always test the lenses only in full-stop increments. Despite that f4.5 isn’t the round aperture number, it’s the largest aperture on this lens, and it was easy for me to see that on f5.6 (next full-stop) is sharper. Not by a mile, but sharper. f8 is sharper than f5.6, if you start looking into details (and I always do). Between f8 and f11 it was really very hard to find any difference except on the very edges, where f11 gets sharper. But in certain occasions I found some details in the shadows on f8 photos that were a little sharper than those on the same photos on f11, but only in the center of the frame. I could not see that difference on 5D mark II, but I saw that difference on my 5D mark 1, because it’s a much sharper sensor. 5D mark 1 has a very weak AA filter, it’s a camera where photography does not suffer collateral damage from video capability. 5D mark 1 is still one of the sharpest (if not the sharpest) Canon cameras out there. Close the aperture down to f16 and easily see that is softer than f11, and f22 is as soft as f4.5, if not even softer. All in all, this lens shines on f11 from edge to edge. Vignetting at those apertures is minimal, if you really want to kill the vignetting completely, lens correction in LR will do it flawlessly with just a single click. 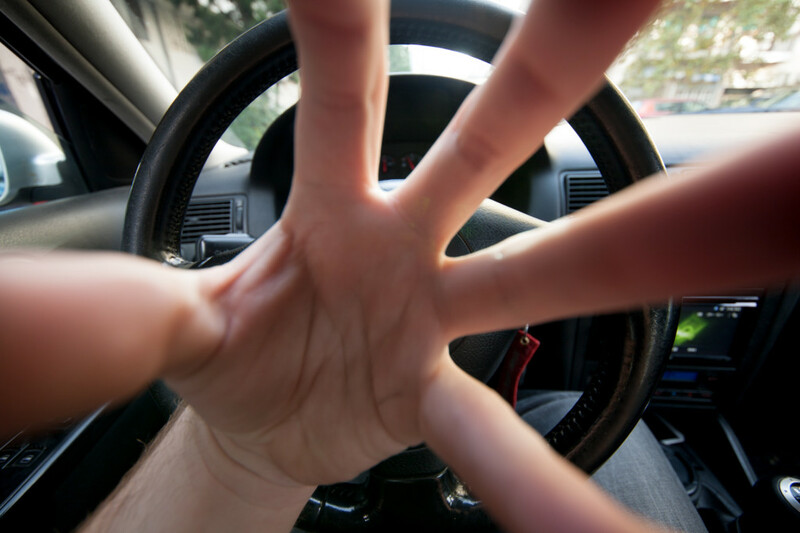 Focus – there is nothing to talk about focus really. You don’t even have to bother focusing with this lens when on 12mm or so. Anyway the focus is fast and silent, I tested it only in daylight and it worked perfectly with no flaws. When I work interiors, I always use manual focus + live view. When people saw me carrying this lens around, many of them asked me what is it like for landscapes. And I’m sorry, I really do not know. I NEVER do landscapes below 50mm, and some of the best landscapes that I’ve made are with 200mm lens. I consider to be a landscape something what is in between the ground and the sky. With wide angle lens you can only make a portrait of the ground in front, or the sky above, while the entire point of the LANDscape, remains a 10px line trough the center of the frame. Wide angles are not for landscapes. Period. I say that this is – a special purpose lens. It’s really easy to see what it’s been made for, and it’s doing that job beautifully. It was a hard day for me when I had to get the borrowed Sigma 12-24mm F4.5-5.6 DG HSM II back to it’s owner. Since I don’t have the Canon 17mm TS-E in mind any time soon, this Sigma is definitely the FIRST LENS ON MY LIST for future purchase. I hope this review will help somebody who is searching for a lens like this for a long time, just like I was, but this Sigma somehow got hidden from me.